Dusk was settling over the Hollywood Bowl Sunday night when soprano Hei-Kyung Hong hung a note so high and pure in the air that I completely forgot that I came mostly to hear my 11-year-old son sing in the children's choir in "Turandot." I've played some opera, but not a lot, and though I have enjoyed the operas I've seen, I can't claim to be an "opera buff." After Sunday night, I just might try. Hong was performing as the character Liu, a slave girl whose master has chosen to try for the hand of the cruel and ice-cold Turandot. The Chinese princess so far has lopped off the heads of her many suitors, all who have failed to pass her test by answering three riddles. Calaf, sung by tenor Frank Poretta, believes he's up to the task, but Liu, who nurses a secret flame for her master, does not wish to "lose the only smile I've ever lived for." Sounds like an opera plot, eh? But the drama centered on the music Sunday night, with a concert performance of the opera led by conductor Gustavo Dudamel, with the Los Angeles Philharmonic (in numbers I doubt would fit in an orchestra pit); 80 voices from the Los Angeles Master Chorale; 40 voices from the Los Angeles Children's Chorale; and a cast of soloists including Hong; Poretta (who was subbing for Francesco Hong); Christine Brewer as Turandot; Alexander Vinogradov as Timur; Timothy Mix as Ping; Daniel Montenegro as Pang; Beau Gibson as Pong; Greg Fedderly as Emperor Altoum and Craig Verm as the Mandarin. Back to Hong, as Liu, she gave an arresting performance, and I also enjoyed Timothy Mix's voice, which flowed so easily. I'd actually been to a rehearsal for the LA Children's Chorale, and I enjoyed witnessing the process by which 40 children first learned their part in solfege, memorized the Italian, learned what it meant, and became aware of its context within the opera. I watched their director Anne Tomlinson work with them until their voices sounded as one, unifying their vowels and also encouraging them to express meaning through both their voices and demeanor. I watched their first rehearsal with the LA Master Chorale -- what a powerful experience, when all voices united for the first time in the "Gloria" at the end of Act II. Sunday was even more powerful, when all those voices came together with the LA Philharmonic, with Dudamel channelling that energy as only he can. 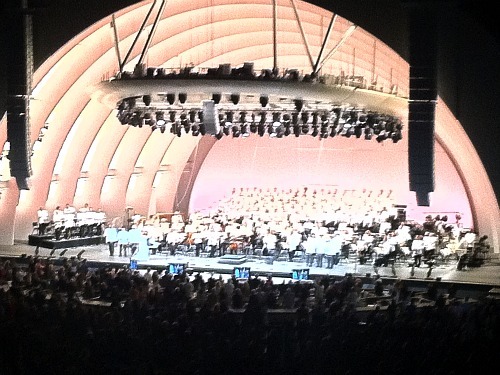 The Hollywood Bowl has some large screens to help the audience get a closer view, and when the camera panned to my son, I saw an expression on his face I'd never seen, a complete immersion in the music. To think that he had the opportunity to perform in the midst of so many talented musicians, to feel that music moving through everyone and everything -- it brought tears to my eyes. Afterwards, someone asked how on earth he sat on stage for three hours, waiting for the few choruses when the children's choir sang. He admitted that his legs began to get a little antsy. But he figured out a way to cope: "I just went with the music."